Synopsis: When Trixie Thomas moves to Lochdubh with her husband intending to open a bed & breakfast, local constable Hamish Macbeth realizes he doesn't like her all that much. And, when she befriends the other village wives and convinces them to make healthier meals, push for a smoking ban and protest a local farmer who wants to knock down an old building that is a home for bats, many of the local husbands (and some wives) join Macbeth in his dislike. When Trixie is found poisoned, Hamish must figure out who disliked her enough to murder her. 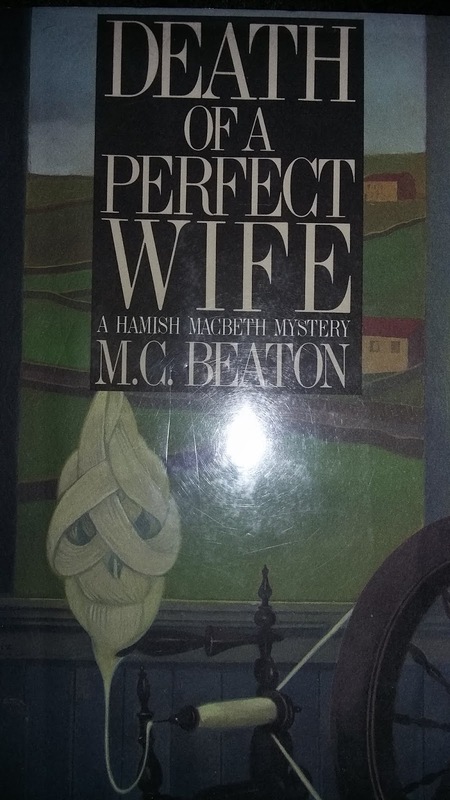 Review: After being disappointed by my last Agatha Christie novel, I decided to give M. C. Beaton's Hamish Macbeth another try and picked up this fourth novel from our local library. Normally, when I get a book like this, it takes me about a week to get through it (sometimes a little longer depending on how busy my schedule is). So, I was actually kind of surprised when I wound up reading this entire book in the course of an evening. This was, and I don't say this lightly, one of the better murder mystery novels I've read recently and ended up being so entertaining, I honestly could not put it down. In fact, I wound up staying up later than I planned to just because I wanted to see how it ended. The thing that I really found interesting about this book was how Trixie, in addition to brainwashing the area wives to the point she was making enemies, also had a lucrative side business that was the direct result of scamming her neighbors. This meant, depending on the actual motive behind her murder, just about everyone in Lochdubh was a potential suspect, including Macbeth himself. In fact, even though I was able to throw out a wild guess that was close and did correctly figure out where the poison was obtained from, I really had no idea who the killer was until Macbeth solved the case. Considering it took me only a few chapters to solve the last murder mystery I read, I am going to give this book a lot of points for that. I also have to admit, even though I normally am not a big romance fan, I am starting to enjoy the ongoing saga involving Macbeth and his on-again/off-again girlfriend Priscilla. Not only was it an interesting distraction at times throughout the course of this book, I will probably keep reading books from this series just to see what happens with the two of them. Final Opinion: This was a book I simply could not put down once I started reading it. I would recommend it as a result (though I would suggest reading the three books that precede it first).